If you were best friends with Brahms, you might hold onto that relationship through all the ups and downs of life. Not so for violin virtuoso Joseph Joachim. A rift between them lasted for years. And it was only a double concerto that could heal the rift. Once upon a time, there was a Hungarian violinist named Joseph Joachim. When he was 8, he went to study at the Conservatory in Vienna, and a little later, he moved to Leipzig to study under the famous composer Felix Mendelssohn. Mendelssohn was so impressed with Joachim's audition that he told him to forget conservatory and play for the famous virtuoso Ferdinand David every so often, study composition, and play professionally in his [Mendelssohn's!] orchestra. Joachim had a very prodigious youth, bringing the Beethoven Violin Concerto into the mainstream when he was 12 years old. (Today, the Beethoven Concerto is usually one of the last concertos taught to students studying violin in college). Needless to say, Joseph Joachim was destined for great things. A little later came the German composer Johannes Brahms. He was born in Hamburg, his mother a seamstress and his father a musician. Receiving his earliest training from his father on piano, young Johannes played in dance halls to help his family make ends meet. Throughout his student years, he studied with Eduard Marxsen, who studied with a pupil of Mozart and was also a close friend of Schubert. A 'late bloomer', Brahms didn't first tour until he was 19 years old. 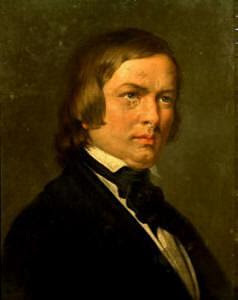 Joseph Joachim and Johannes Brahms met in 1853. They were roommates in Gottingen for a while. 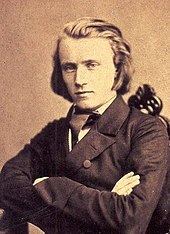 Joachim was 21 and Brahms was 19 - both were first class players and composers, but Brahms was a little under the radar. While they were rooming together, Joachim acted as a mentor to Brahms, teaching him orchestration and introducing him to the Schumanns. Robert Schumann liked Johannes Brahms so much that he wrote an article in his music journal (New Journal for Music out of Leipzig) praising him. This act brought a young Brahms to the public eye. This meeting led to a life-long friendship and correspondence. In their letters to each other, they would share counterpoint exercises, which I guess is what composer friends do. When Brahms was writing for strings, he would always consult his friend Joachim before bringing the scores to the publishers - This correspondence is especially evident in his Violin Concerto. The original manuscript is covered in Joachim's red ink! Unfortunately, Joachim and Brahms had a falling out. Joachim thought that his wife was cheating on him, and of course he could count on his buddy Brahms to back him up, right? Wrong! Brahms was certain that Joachim was just being paranoid, so he wrote a letter to Mrs. Joachim (aka Amalie Weiss) saying so. She then used this letter against Joachim in their divorce proceedings. Oops. It was years before Joachim spoke to Brahms again. 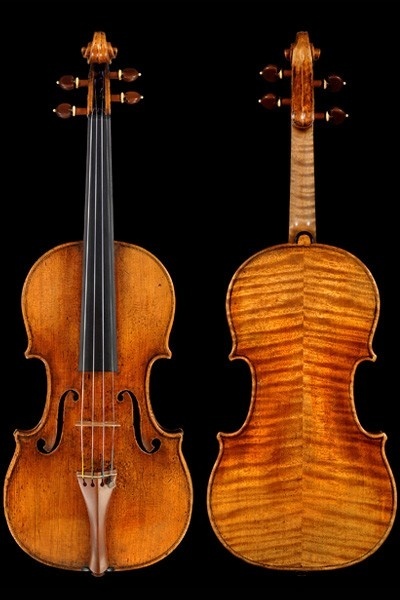 Eventually, Brahms wrote his Double Concerto for Violin and Cello as a peace offering, which Joachim accepted. Brahms was not long for this world after this offering. Within ten years, Brahms had developed cancer, and, on April 3rd, 1897 joined the heavenly choir. Two years later, when a statue in honor of Brahms was unveiled, it was Joachim who made the speech (I am imagining a single tear glistening as it flows down to absorb into Joachim's beard). 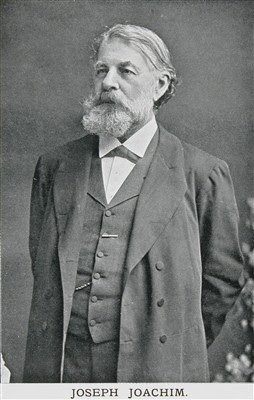 Joachim lived for another 10 years, dying in 1907. He lived long enough to do some recording in the early 1900s, though. Here's a recording of him playing Brahms' Hungarian Dance No. 1. While there aren't any pictures of Brahms' piano online, the Schubert Club Museum has an exhibit including a keyboard that Brahms himself played on - and while you're in Saint Paul, Minnesota, stop by and visit us at Fein Violins!